Peter Skrzynecki explores various aspects of belonging and not belonging in his poems "ancestors", "Feliks", and "10 Mary Street". Using language techniques such as enjambment, simile, metaphor and alliteration Peter Skrzynecki broadens the reader's concept of belonging through the medium of poetry. Peter Skrzynecki uses the theme of not belonging in his poems to contrast, and thereby better convey, his ideas on belonging. 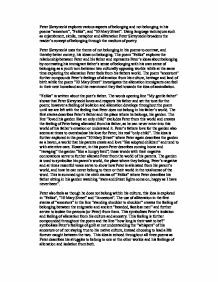 The poem "Feliks" explores the relationship between Peter and his father and represents Peter's ideas about belonging by contrasting his immigrant father's sense of belonging with his own sense of belonging as a youth torn between two culturally opposing worlds while at the same time exploring the alienation Peter feels from his fathers world. The poem "ancestors" further compounds Peter's feelings of alienation from his culture, heritage and land of birth while the poem "10 Mary Street" investigates the alienation immigrants can feel in their new homeland and the resentment they feel towards the idea of assimilation. "Feliks" is written about the poet's father. The words opening line "My gentle father" shows that Peter Skrzynecki loves and respects his father and set the tone for the poem; however a feeling of ...read more. from them. This symbolises Peter's isolation and feeling of alienation from his culture and ancestry. This feeling is further compounded throughout the poem and the line "how long is their wait to be?" symbolises Peter's feelings of guilt at not understanding the "whispers" of his ancestors or of not staying true to his native culture, instead choosing to lead a life forever caught between the two. This idea is echoed throughout all three poems as Peter describes his struggles to belong to one or the other worlds and his feelings of alienation and isolation from both. Peter shows these feelings of isolation and alienation from his culture and homeland in "Feliks" in the third, fifth and seventh stanzas. In the third stanza he uses the negative word "violently" in connection with the cultural handshake of his fathers polish friends. He does not understand the lands that they talk about and cannot feel the sense of loss his father does at their diaspora as he has never seen the farms and fields that his father so misses. ...read more. 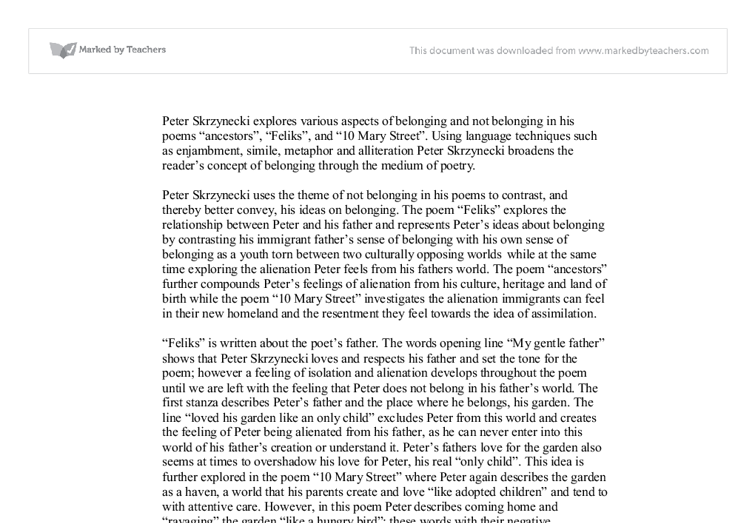 The poem "Feliks" focuses on Peter's relationship to his father and belonging in relation to Peter's sense of not belonging to his father's world. The poem "ancestors" focuses on Peter's guilt at not belonging to his culture and heritage, at "denying his ancestors" and his blood. The poem "10 Mary Street" focuses on the idea of immigrants belonging or not belonging to their new homeland. Throughout these poems Peter Skrzynecki uses many language techniques along with the theme of not belonging to explore his ideas about belonging. From these poems we can surmise that all humans have a need to belong, whether it is belonging in their family, in their cultural heritage, their homeland or the land where they now live. We also learn that belonging is an ambiguous thing that cannot be easily defined or had, one cannot belong simply because one wants to, you either belong or you don't and for some reason, no matter how hard you try it will always be down to the acceptance of others and not your acceptance of them. The End ...read more. he will try to mend his wrong-doings if she agrees to do the same with hers. However once he says that her sense of loss over her child should be 'satisfied' she sees the negativity in this and says that he is sneering. How have the poets you have studied different aspects of love? This theme is common to many love poems. 'A Woman is a Worthy Thing' is a poem just about praise for women in general. It is a poem from the medieval time period, meaning equality between men and women was always an issue. Comparing and contrasting three poems that portray the yearning to belong. A theme of regret, coupled with loneliness is distinguished, as the poet "longed to forgive" the bullies, but never had the chance. The constant use of "I" and "Me" tells the readers how the poet was lonesome. Therefore, I get the impression that the poem is written based on a bitter childhood memory. If you read this carefully, it is describing from his feet to his eyes, as if the anger is building up inside him. In the third stanza, Tatamkhulu Afrika writes about the restaurant in the middle of District Six. He describes the restaurant as, haute cuisine, meaning that the food is posh and tasty. This is a relief for us that they are entering back from the mouth of Hell, the soldiers have miraculously survived the jaws of Death. The verse is finishing with the line 'All that was left of them, Left of six hundred'. But she goes on to say that when grief did not kill her, she realised she could function and carry on 'without the aid of joy.' In the last two stanzas, Bronte is resolved. She controlled her despair and decided to get on with her life. The last line recalls her mothers advice Form 1. 3 Stanzas of describing her qualities of her love 2. No full stops, love is everlasting 3. Song - so written with no punctuations Structure 1. The separate stanzas show the different stages in her life. Finishing with a recollection in the mothers memory 2.